In the original announcement, the names of their magazines were not listed after their names, which is the reason the titles are in italics in the above list. At age 26, I was the youngest of these editors, though I confess that I didn’t let that fact diminish my self-confidence. The first issue had just come out, featuring a copy of the blueprint order form from my job at Larwin, an architectural firm I had worked out for two years along with an aspiring landscape architect named Steve Davis. The recession of 1974 had cost me my job, though I was hardly disconsolate at being able to stay home and work on my writing and editing instead of standing in front of a machine and feeding it sheet after sheet of light-sensitive paper. I don’t believe that Michael, John, Jim, Paul, and myself thought of this evening as being particularly special, and yet in retrospect it amounted to an unusual gathering for any major city in the United States. How often did five editors of five memorable magazines ever read together at the same venue? One of the DIY organizations that we launched at that time was Literary Publishers of Southern California (LPSC), which was an early attempt for form a book-distribution cooperative. 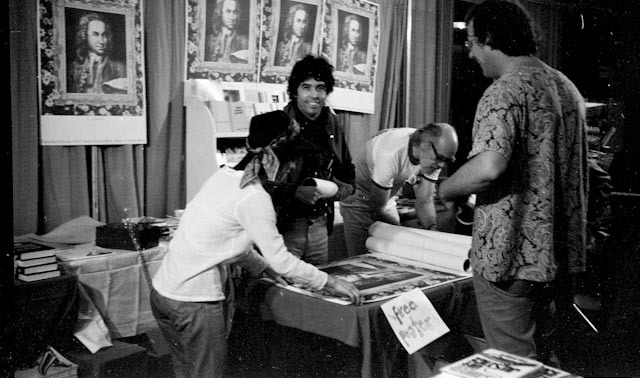 We signed up for some tables at a book fair in Los Angeles in the mid-1970s. Rod Bradley took several photographs of editors at the fair. 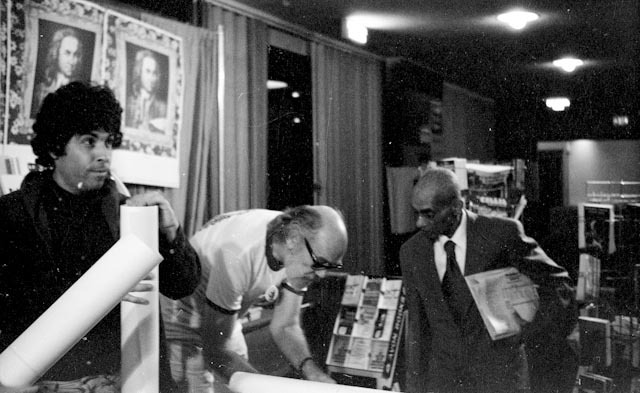 John Harris (leaning over table); Michael C. Ford (standing behind table), and unknown attendees at book fair. 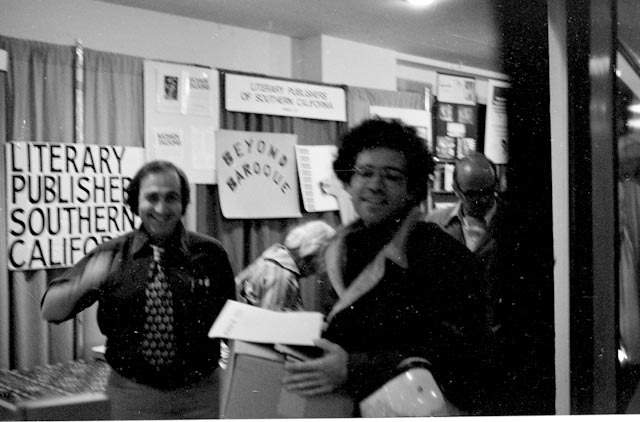 John Harris; Michael C. Ford, and unknown attendee at book fair. Jack Grapes (lifting cup); Bill Mohr (with motorcycle helmet crooked under arm with box of books); in the background, Luis Campos? All photographs (c) copyright Rod Bradley, 2017. Permission to reproduce must be obtained from the photographer. Posted on July 9, 2017 by billmohr. This entry was posted in Books, Los Angeles bookstores, Poetry, Small Press Publishing. Bookmark the permalink.